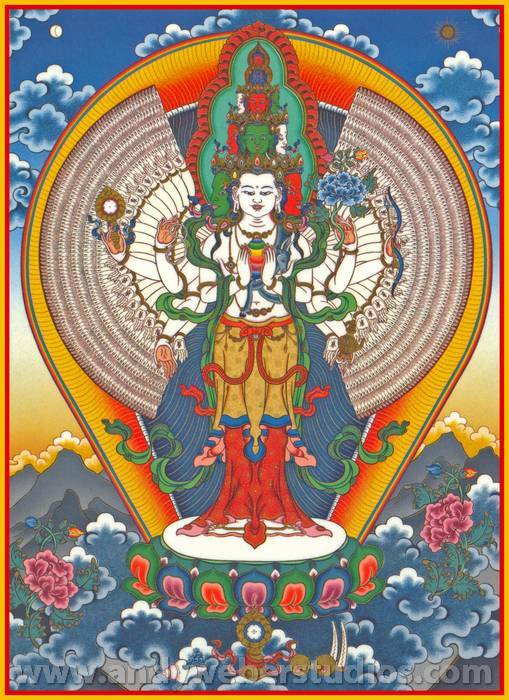 The manifestation of all the Buddhas’ compassion in the 1000-armed aspect. According to legend, the most famous patron deity of Tibet Avalokiteshvara, took a vow in front of Amitabha Buddha never to give up work to liberate all sentient beings from samsara. After aeons, he looked at his achievement and felt disillusioned with his efforts. His body split into 1000 pieces. In his agony, he cried out to Amitabha, who then transfigured his head into 10, put in each hand a wisdom eye and placed himself and Vajrapani (aspect of skilful means) on top.